The progression of aerial photography stretches back further than many of us would expect. Many people might think that aerial photography first started with planes, and not that long ago with the limitations of technology and the size of cameras. However, photographers have explored the potential of the aerial image in photography for centuries. There is always that desire with human nature to explore further and reach higher. With photography, there is the desire to take shots of things that no other man has taken before or to look with better clarity and detail. This aerial photography was that achievement for a while in the 19th century. There was the awareness of what was achievable up in the air, with great panoramic shots, if only photographers could rig the right camera system to the right object. Therefore, long before the shots from planes and helicopters – there are tales of camera equipment on balloons, kites, and even birds. The hot air balloon was revolutionary regarding air travel. It all seems old-fashioned and romantic now, but the science and wonder behind the devices gave them great appeal. After all, this was how the Wizard arrived in OZ and the only way to get around the world in eighty days. This sense of adventure and ease of travel was largely due to the height and views of the landscape. They provided an aerial view of the world that was remarkable. Naturally, the next step for photographers was to try and rig up a camera onboard these balloons to capture the images themselves. This lead to the work of Gaspar Felix Tournachon. A man credited with the first known aerial photograph in 1858. He was both a photographer and balloonist working in France, and he wanted to combine these passions. The idea came to him in 1855, when he patented the idea of mapmaking and surveying through aerial photographs. His first successful picture came three years later with a view of the French village of Petit Bicetre (now Petit-Clamart). The whole process was difficult, due to the complexity of the equipment and the need to process the image in a portable darkroom 80m up in the basket of the balloon. It all sounds a little ridiculous to modern day photographers, but this was the starting point for bigger, better things. Next, we have the kite. This is something that few contemporary photographers would consider now. This is partially down to the static nature of the shot, the method and the fact that kites are a little antiquated these days. We are more likely to see go-pros on gliders and photographers setting up drones than people rigging a camera unit up to a kite. Still, this was the best choice for aerial photographers at the turn of the 20th century. The kite was relatively stable and reliable, not to mention easy enough for any photographer to build or obtain. Two great examples are Arthur Batut and George Lawrence. Mr. Batut is widely considered to be the first photographer to set up a timed rig on a kite. He did so in 1889 when he used a lit fuse to set up the camera for aerial photographs of Labruguiere, France. A few years later, in 1906, George Lawrence set up his camera system, this time with nine kites and a more substantial 49-pound camera. The result was an infamous image of San Francisco after the earthquake. This was a great example of a photographer going beyond the reaches of most to find that perfect shot of wide-scale devastation. There are parallels to today’s drone shots from areas hit by hurricanes or forest fires. At this point, it was all about manipulating accessible flying objects to use them to take a photograph. The kites were a brilliant floating prop to suspend a camera in a fixed position. The next approach in the aerial photographer’s arsenal complicated matters slightly with a moving, living assistant. The idea of putting a camera on a bird isn’t that strange these days. Wildlife camera operators and film-makers rig up small cameras to capture the flight paths of migrating species all the time. The aerial shots are a nice secondary benefit to the scientific data. However, there are much earlier examples of birds used as cameramen. Unsurprisingly, it was the humble, tame pigeon that took on the role. Pigeons were the unsung heroes of the war effort, with many sending messages and helping troops. During the first world war, photographer Julius Neubronner attached timed cameras to homing pigeons, rather than messages, to capture aerial shots. These cameras were set to capture an image every 30 seconds from a rig on the bird’s breast. This is quite a progression from the fused timers on Mr. Batut’s kite. A history of aerial photography wouldn’t be complete without looking at the work of photographers and pilots in planes. The rise of fast, effective aircraft and personal planes gave photographers more opportunity to head into the clouds and capture images of the scenes below. By this point, the cameras had also become much more portable and manageable for this sort of application. This was a long way from Tournachon’s darkroom on a balloon. Photographers in planes, and remote cameras on the underside of planes, all played their part in the advancement of aerial photography. The images helped with intelligence and surveying in the war, and continue to help many industries today. Work with aerial photography and planes began with L.P Bonvillain, who worked with Wilbur Wright in 1908. 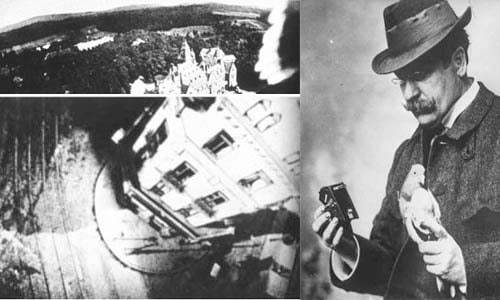 He captured the first ever aerial photograph from a plane and pioneered the approach. His work over Italy more than a century ago showed the potential for image capturing from aircraft. This would develop across the 20th century with work with military planes, survey planes, and commercial approaches. An excellent example of a commercial application for aerial photography with planes came just after the Second World War. The focus shifted from war efforts and intelligence to the potential of these cameras for other images. Sherman Fairchild began working on the idea of creating aerial maps. He essentially took Tournachon’s idea from the 1850s for map making and made it a reality. Before we move onto the natural progression from helicopter and plane based aerial photographers and drones, we need to look at rockets. This is a factor of aerial photography that gets easily overlooked. However, many satellites and rockets collect images of the Earths surface and atmosphere. Here this aerial photography is not about commercial factors, but scientific ones. These images help us to expand our views and knowledge beyond the usual capabilities. They provide vital data and imaging. This all began with V-2 rockets just after the Second World War. 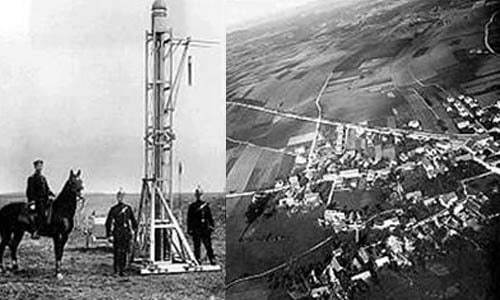 These German-built long-range guided missiles were responsible for the first images from space, following their launch at White Sands, New Mexico. This was revolutionary at the time, and camera for rockets have developed ever since. We can now look down on our planet with impressive detail. The modern day approach to aerial photography with drones. For a long time, many saw these aerial shots with helicopters and planes as the best way to get any footage, either still or moving. This craft can fly over most areas for a long period and allow for great images with the right equipment. Surveyors, professional commercial photographers and those from many other industries will still turn to these methods where they can. However, there is a new option on the market that outshines this approach in is efficiency, cost and ability to access inhospitable areas. That is the drone. Unmanned aviation vehicles are the next best thing because they act like the perfect little flying camera – as long as they are in skilled hands. There is a disconnect between a remote camera on a plane and the photographer on the ground. This disappears when we have a first-person viewing system between the drone and pilot. It allows users to set up shots and plan ideas with greater ease. The only better connection between photographer and cameraman is to be sat up in a helicopter with a DSLR. There are other benefits of drones for aerial photographers too. They are easy to launch and fly in all kinds of situations, with no hassle about flight plans and a clear route for the best shots. Operators can launch the drone and see what inspires them. The only downside is that short battery lives and FAA laws do limit distance and time in the air. Drones are just carrying on the work of aerial photographers, and their operators share similarities with those that worked with kites and birds. In many ways, modern ventures with aerial photography and drones aren’t all that revolutionary in their aim. The basic principles or exploration and photography are the same. We all want to capture the best possible images from the sky of great landscapes. That old photo of San Francisco after the earthquake from the kite has similarities with images of other natural disasters and war zones taken by drones where humans cannot travel. It is all about providing that impossible image. Then there are the commercial aspects. Clearly, there has always been a market for aerial maps and photos of our landscapes and cityscapes. We just have the benefits of being able to provide them with much great definition now. What has changed with drones is the capabilities of the cameras and the way that we operate them. What is the future for Aerial Photography? As long as there is that desire to get above the clouds and take the best possible aerial image of a scene, we will develop better ways to do so. Drone flight may seem like the pinnacle right now, but even this niche area has seen many developments over recent years. We have gone from a simple mount with a Go-Pro and edited footage, to users with high-end HD cameras with real-time controls thanks to the first-person view. There is no doubt that these camera drones will only become more sophisticated and powerful with their flight potential. This, in turn, increases the opportunities for longer footage and better images. In fact, the only real restriction here on aerial photographers is the laws on flying drones, not the devices themselves. What is the next big thing for aerial photography? It ‘s hard to predict where all this will end up. The ongoing popularity of the Go-Pros with extreme sports and base jumping also suggests the potential in wearable tech in human flight – but this is more about the sport and the experience than the image. Those setting up fused timers on kite rigs wouldn’t have predicted the cameras on military planes. Those flying those military planes in the wars wouldn’t have predicted the tech used in UAVs. At the moment, this is the closest thing we have to a robotic flying camera. The next step there is to increase the capabilities. Either way, as long as there are cities and landscapes to survey, disasters to document and artistically inspired photographers, we will keep looking for that perfect aerial solution!